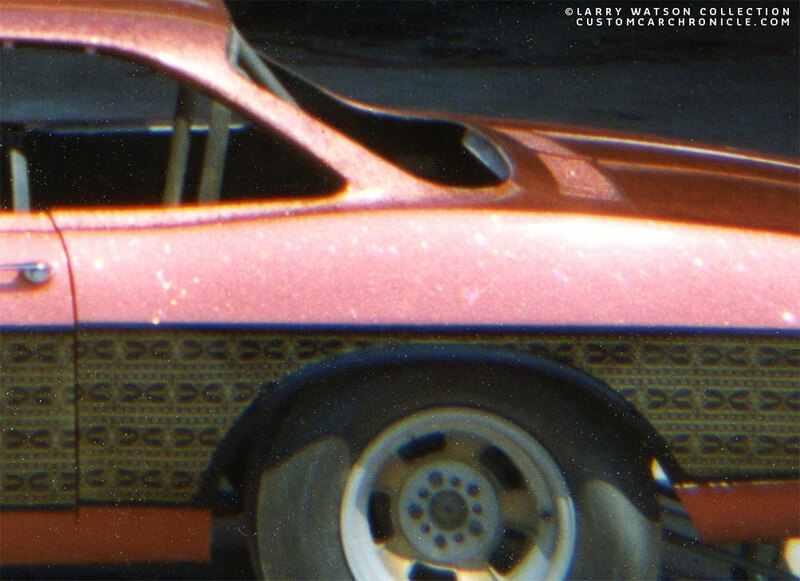 Larry Watson often gets credits for inventing the lace paint job on cars. But it was actually a Von Dutch story that inspired Larry to start experimenting. 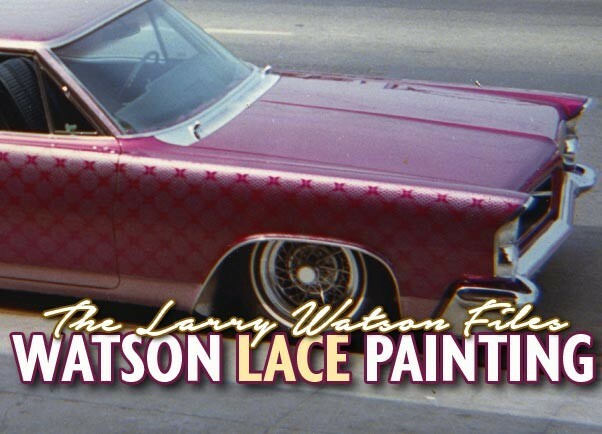 This article shows a selection of photos of Larry Watson Lace paint jobs. Most of these photos come from the Larry Watson Personal Photo Collection. 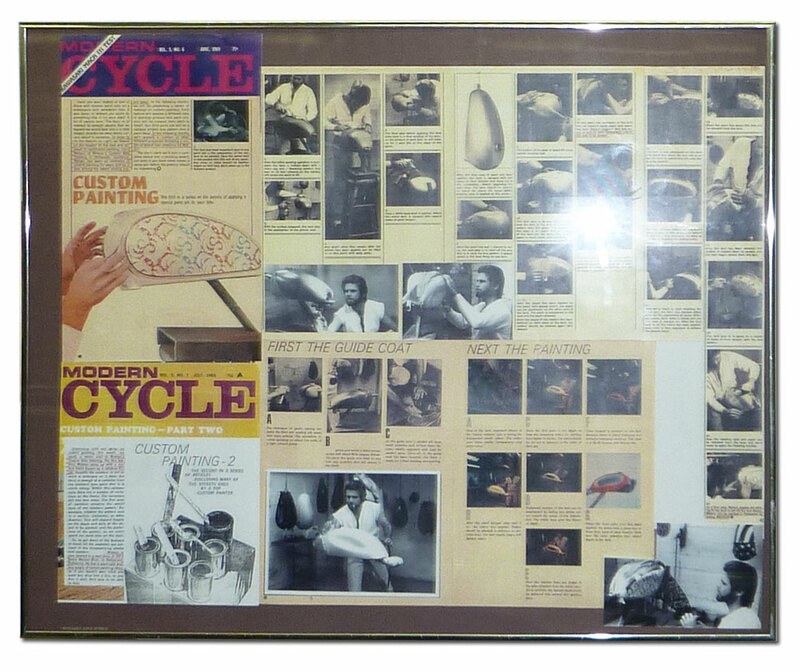 More on Larry’s personal collection can be found in the Larry Watson section on the CCC-Site. 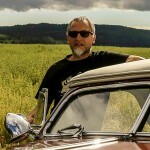 Or on the Custom Car Photo Archive. 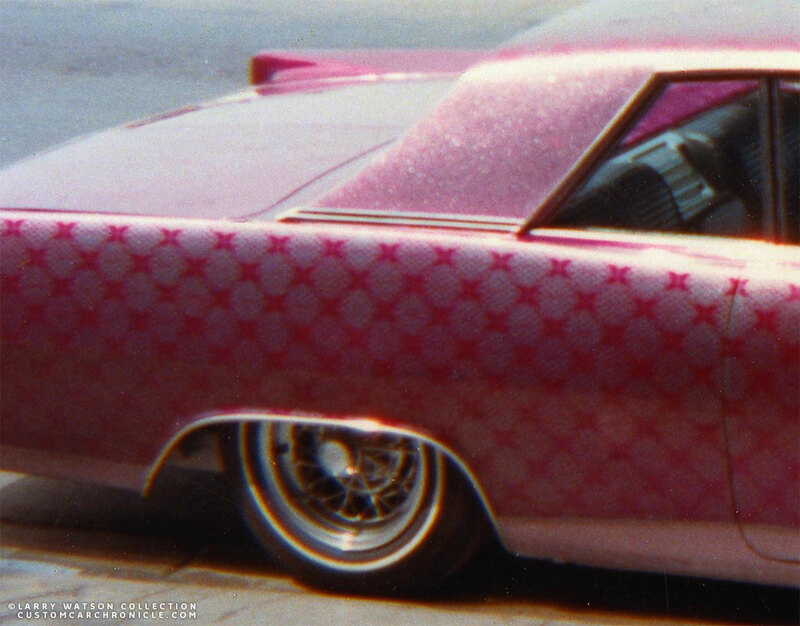 Special thanks to Roger O’Dell for scanning this amazing material and sharing them with us on the Custom Car Chronicle. 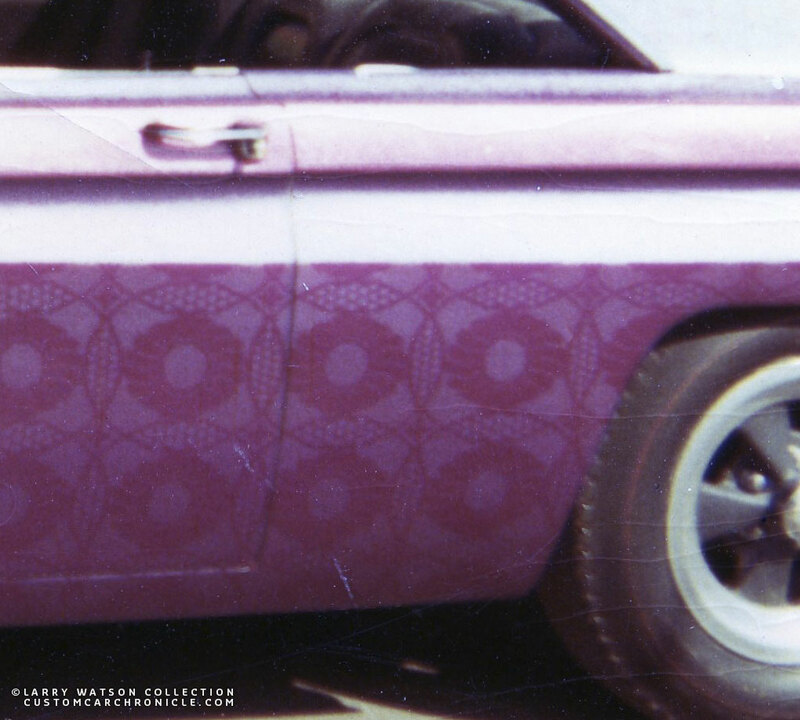 Lace painting on cars has been very popular in the late 1960’s and 1970’s. The Low-riders used it a lot of their wonderful creations, and the technique was also very popular with the van builders. Several people usually get credit for developing, inventing the lace painting on cars. 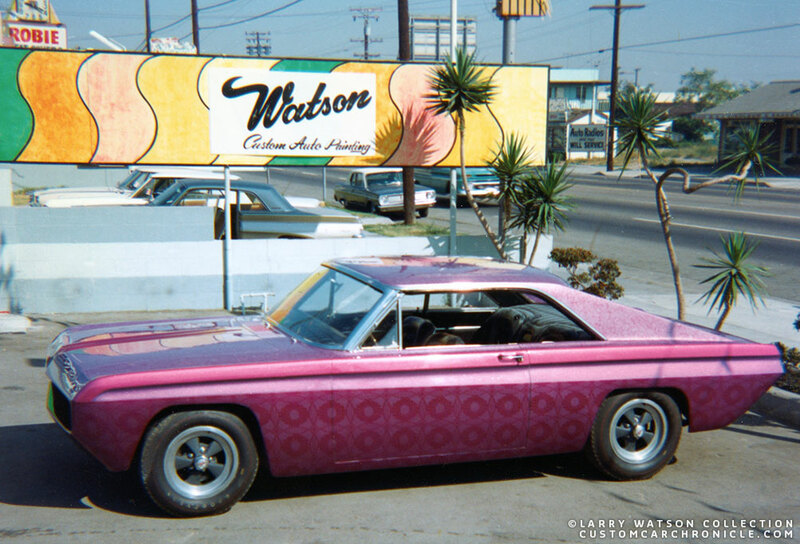 Larry Watson is most often named to be the first who did a lace paint job on a custom car. 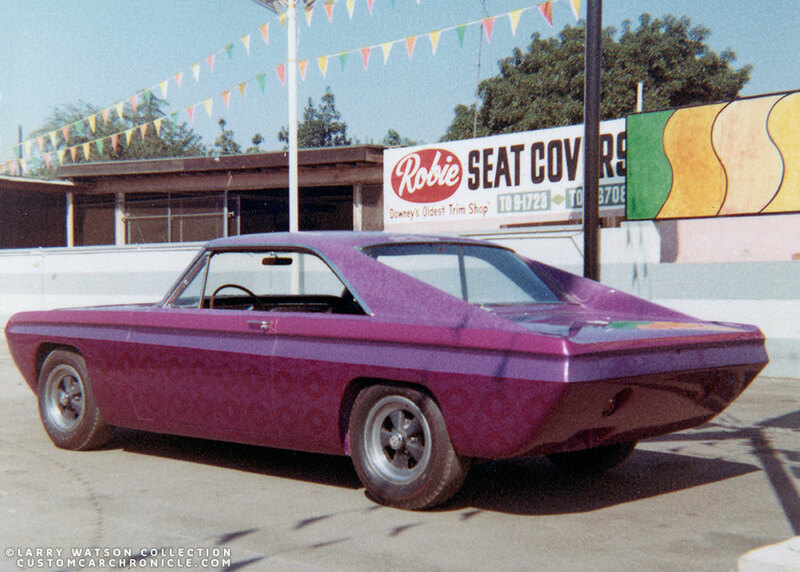 George “Crazy Painter” Cerny Jr has been told to paint dragsters with lace as early as 1963. 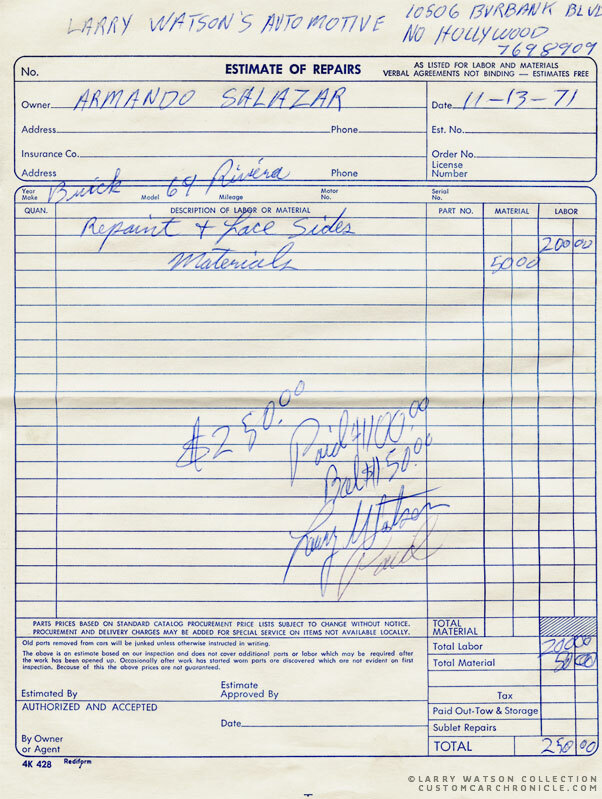 Custom painter Joe Anderson gets credits for doing lace painting on a dashboard the later part of the 1960’s. 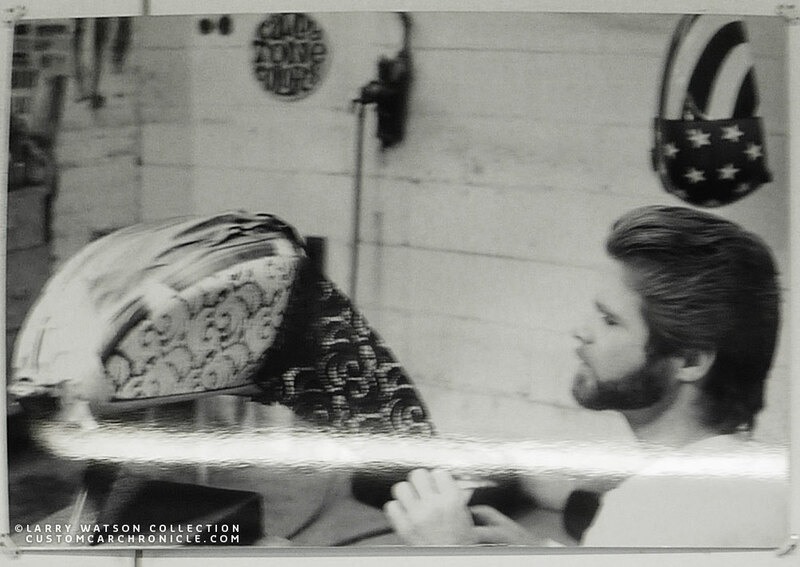 We know that Larry did his first lace paint-job in late 1966, and most likely it was at least a year later that Joe Anderson’s lace paint-job was documented. But it was actually Kenneth Howard (Von Dutch) who came up with the idea of lace painting… unintentionally. Lets take a closer look at Larry’s story on lace painting. Larry first lace paint job was created in late 1966. Larry had just been away from Custom painting for a while, being an actor in Hollywood. 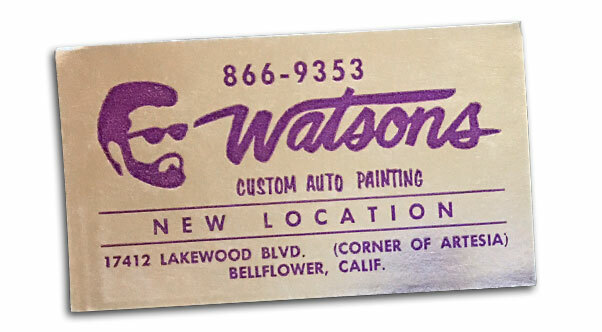 But after about a year, when the acting jobs had dried out pretty much for him, he went back to painting cars in his Lakewood Blvd, Bellflower shop. One night while he was thinking about what he could do next for new techniques that could draw many new customers, he remembered a story from 10 years ago. In the mid 1950’s Larry spend some time with Von Dutch. Von Dutch had told Larry a story about his work bench and how he had accidently pushed away an old doily that had been on the bench for ages. All the overspray from perhaps years of spray painting in the shop had left an bitchin design on the bench. Von Ducth actually liked it so much he clearcoated that section of the workbench, just to save it. With the Von Dutch bitching doily overspry story in mind Larry went to a large L.A. yardage store, looking for lace that might look good on a car. It needed to be not to flowerly, or curly like most lace designs are. So it took him a little while before he found a nice graphic lace, with large “X” shapes in it, that he thought would work fine. He bought several yards, enough to do 2 sides and the roof of a car. 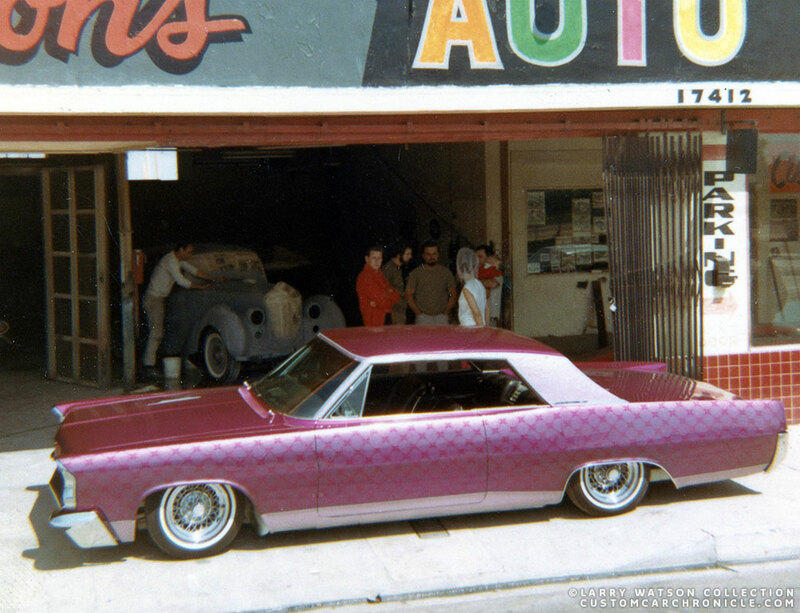 At the time Larry had Doug Carney’ 1963 Pontiac Grand Prix in his shop which he had prepped for a new paint jobto be entered at the 1967 L.A. Sports Arena Custom Car show. This car was going to be Larry’s first ever lace paint job. Althought Larry might have been the first to do a automotive lace paint job, there are not to many documented lace paint jobs done by Larry. I have gathered all the lace pait projects I could find in the Larry Watson Personal Photo Collection and gathered them in this article. 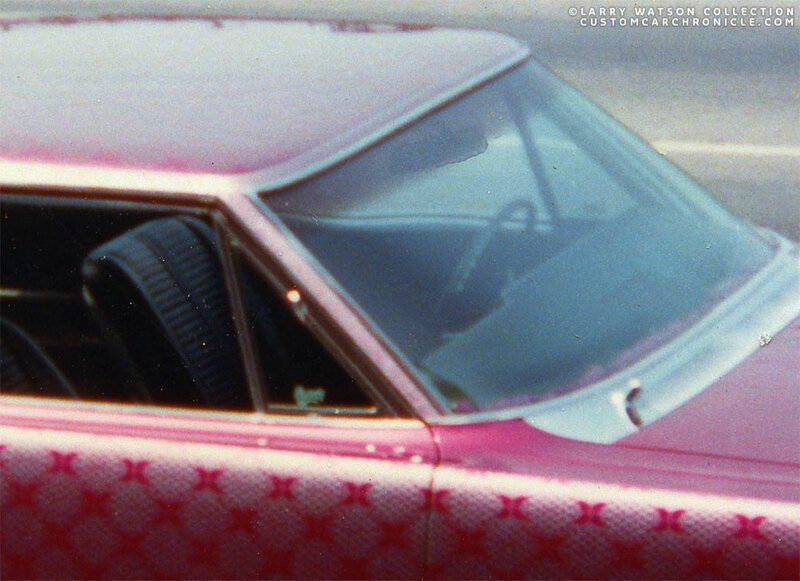 Once Larry had painted Doug Carney’s 1963 Pontiac in a shade of candy fuchsia, he masked off the to be laced panels on the side and the top of the car. He then carfully aligned the lace and taped it to the car. He mixed some special paint to experiment with, realizing hecould not go with heavy coats. A half-gallon of thinner mixed with quart-pint of ink-blue toner, a table-spoon of blue Murano pearl and he was ready. He carefully sprayed the car, making sure not to coat it to heavy, walking the car spraying the laced panel in one continuous stroke, front to back. Then he removed the lace and the result was stunning. Freshly finished first ever lace paint job on a car on Doug Carney’s 1963 Pontiac Grand Prix gets the last final detail touch ups from Larry Watson. 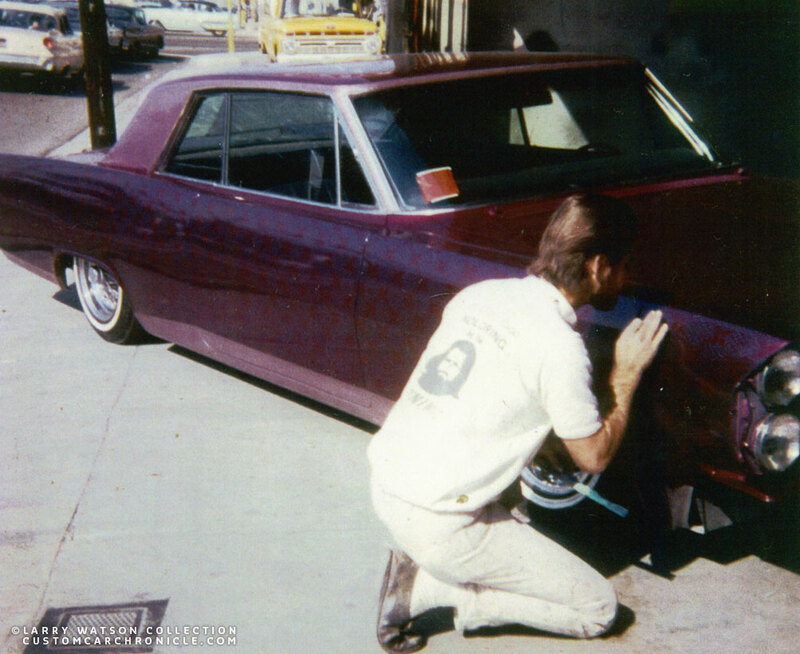 Finished first lace paint job… Doug’s Pontaic is ready to get the chrome installed again to get it ready in time for the 1967 L.A. Sports Arena Custom Car show. 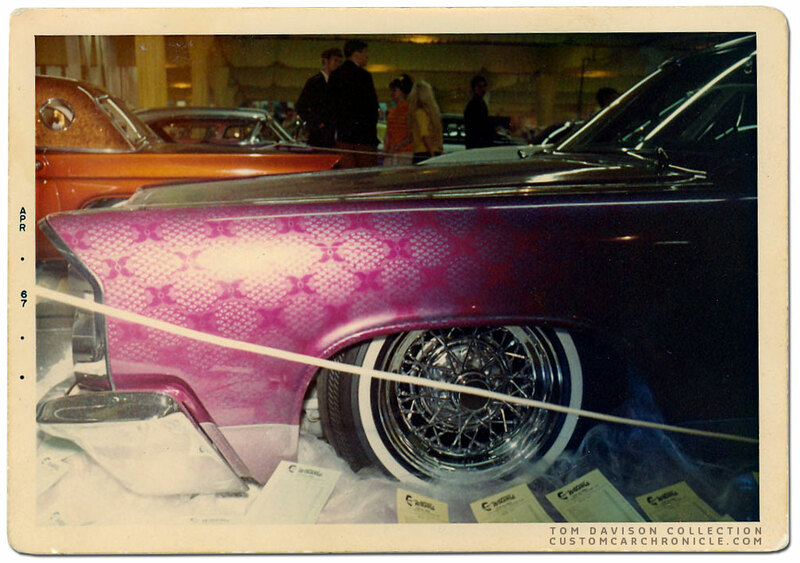 Doug’s Laced Grand Prix turned heads where ever it went, and won ‘Best Paint’ at the 1967 L.A. Sports Arena Custom Car show. And with this first lace painting Larry had started another trend that would become very popular during the 1970’s and is making a comback in the last couple of years. I wonder if the people at the Watson shop realized what impact thiscar would have of the custom painting in the next dacade… and more. Doug Carney taking off from Larry’s Lakewood Blvd. shop. The guys watching on the side walk is just the typical reaction the lace paint job got. The people on the street, or anywhere had never ever seen anything like this before. Tom Davison was able to capture the lace painting really well in this 1967 photo. Parked in front of the Lakewood Blvd shop some time after the paint job had been finished. Doug now has the cowl panel chrome plated. This photo shows the paint a little more red than the car actually was. Close up of the rear portion of Doug’s Grand Prix gives a good impression of the lace paint. The dark sections aswhat was covered by the lace. The lighter sections was covered by the pearl mixture. Portions of the top, including the pillars are flaked. Hard to tell from the photos we have, but the roof was also laced. This photo shows a bit how the center section of the top was painted the dark color before being laced. Laced in black and gold on this dragster at the Lakewood Blvd shop. Enlarged details on the dragster paint job. 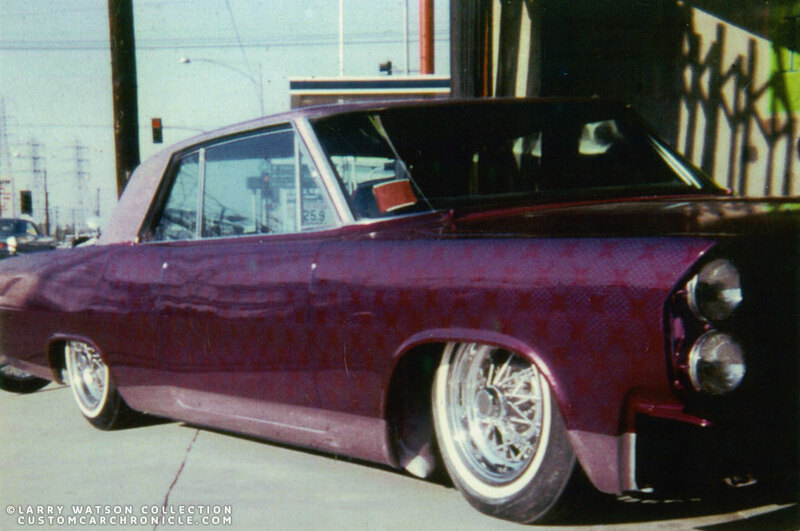 Another famous lace paint job Larry did was on the 1969 Buick Riviera of Armando Salazar. 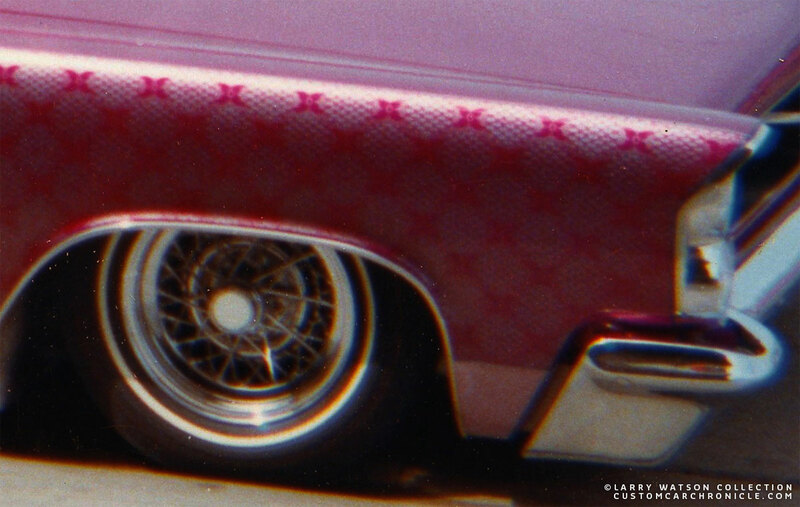 Several photos of this graphic laced Buick have appeared in several publications. 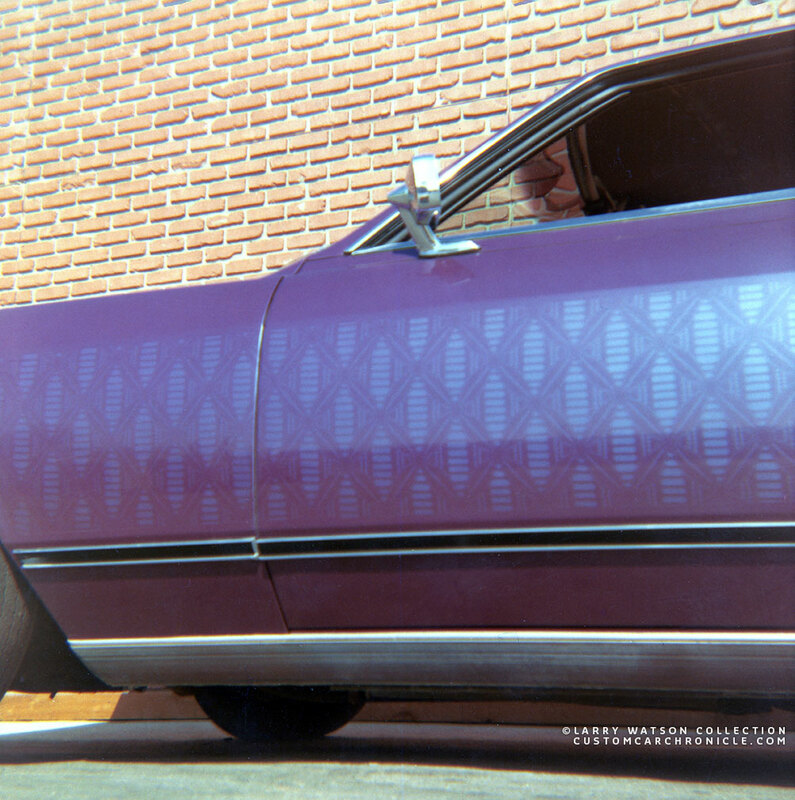 The photos with the model with flower dress, go-go booth posing with the car dressed up with Cragar wheels and this amazing lacepaint job really completed the picture, creating the ultimate early 1970’s look. Cragar wheels, thin line white wall tires and an amazing pearl paint job highlighter by side panels done with subtile pearl blue lace patterns. Close up of the lace paint section shows how the pearlslight upand create an unique effect. 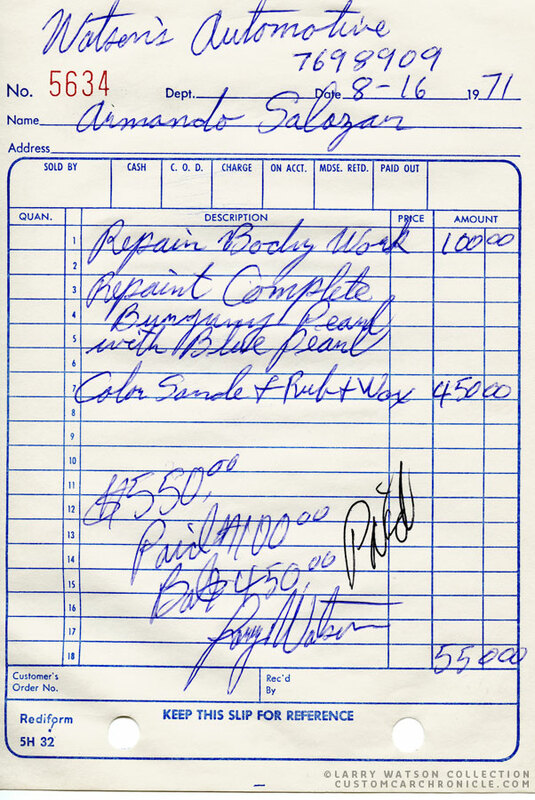 For some reason Armando’s Buick had to be repainted in November of 1971. The full paint job including lacing now only cost $250.-. We are unsure if the photos of the car shown here are before or after the repaint. 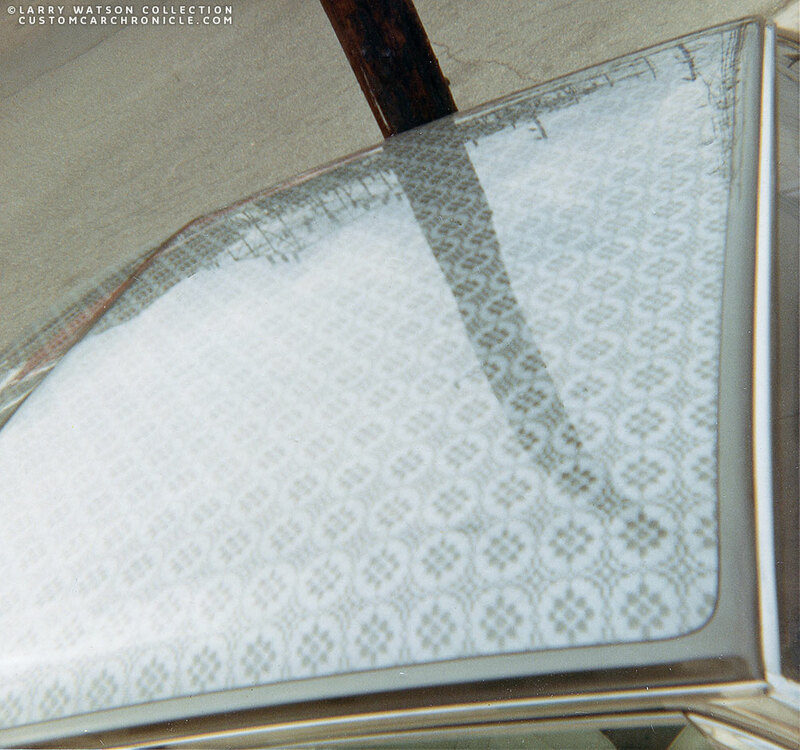 Laced roof panel of an unknown Watson car. Sadly the photo is a bit out of focus. 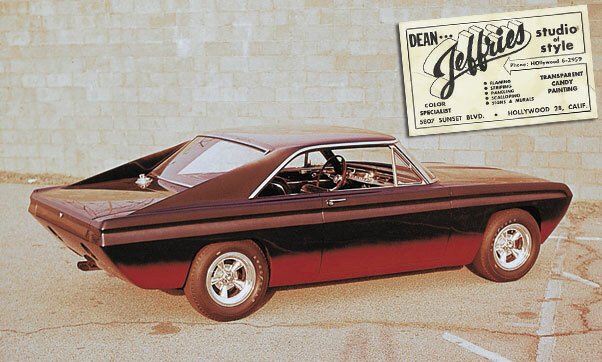 Dean Jeffires created a customized Ford Falcon for the 1963 Ford Custom Car Caravan in just three weeks time. The car toured the whole US for month. Dean originally painted it in burgundy fading to black. 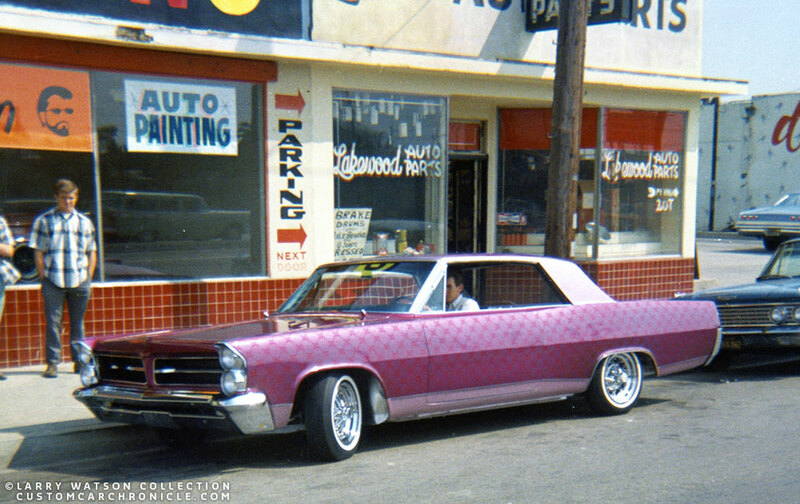 At some point a new owner must have brought it to Larry Watson at his Firestone Blvd Downey shop for a new paintjob. 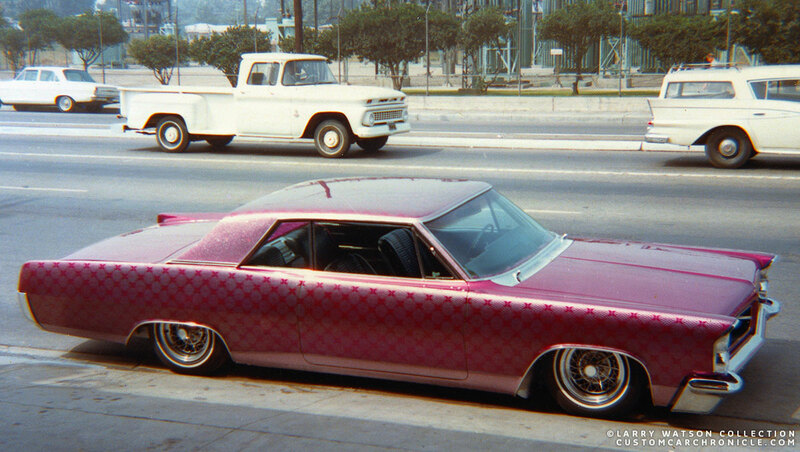 Larry repainted the car in a shade of fuchsia and added cobwebed and lace painted panels to the car. This is how the Falcon Python looked like when it was first created and finished by Dean Jeffries. 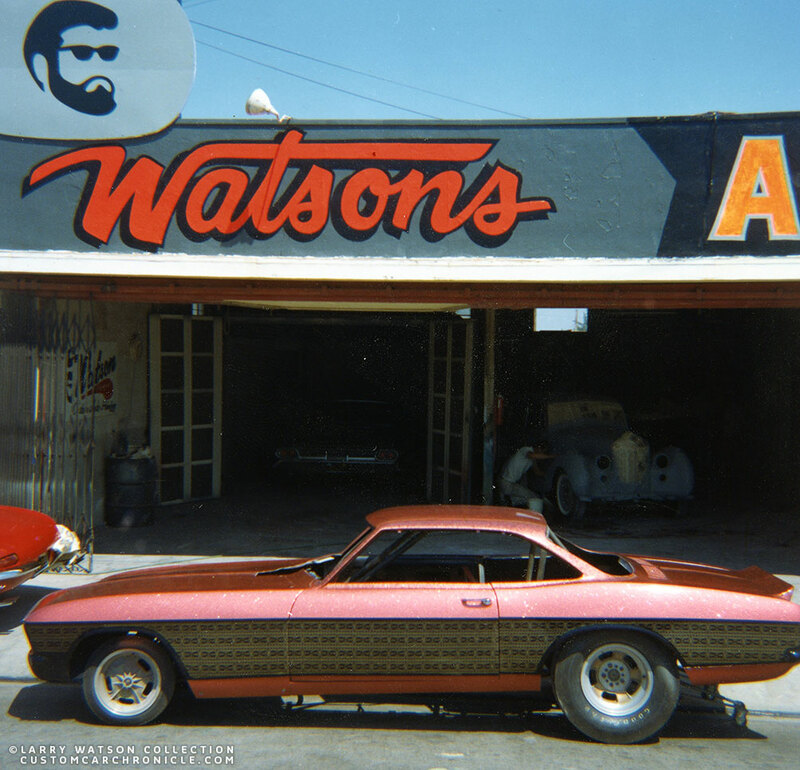 Here is the Falcon after it has been repainted, laced and cob–webbed by Larry at his Firestone Blvd shop. Close up shows the very large graphic pattern of the lacing, which worked really well with the car. Larry also custom painted a lot of bikes in his career. and several of them recieved lace painting on the tank and fenders. 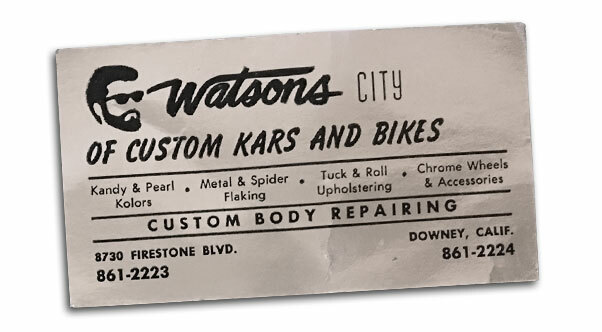 In none of the photos of the finished bikes we have found this is shown, but we did find a few photos that show Larry aplying the lace to a tank for an Modern Cycle magazine article as well as a set of fenders and tanks fresh from the paint booth in Larry’s Firestone Blvd shop. This is a photo taken of a large photo on the walls of Larry’s museum. It shows how Larry pulls away the lace after having painted a bike gas tank with a contrasting color. This photo was taken as part of a magazine article. A two part Modern Cycle magazine article on Larry custom painting bikes. Included are some photos showing how to lace paint. This photo was taken at the Watson museum. 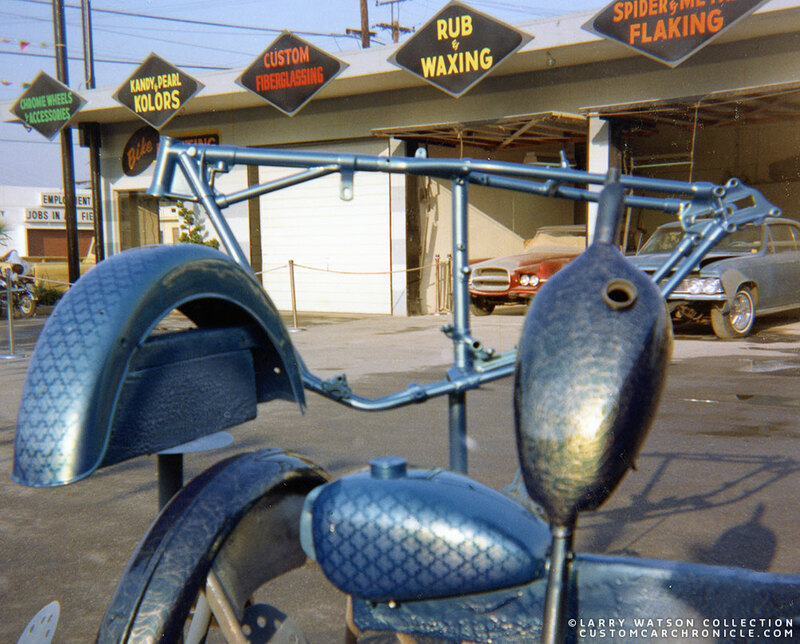 A fender left and a gas tank, center lace painted at Larry’s Firestone Blvd shop. Memo your right the laquers were easy to use back then, i messed around with the lace patterns on a few cars i always tried different ways of using that effect with good results. Larry watson got it right ! Lace work was popular when i was just a lad. I have seen some great ones done in guys garages that looked every bit as good as the pros. Hey Rik. Now we need a primer on doing “Cob webs”. May be Mermo can help out on that. 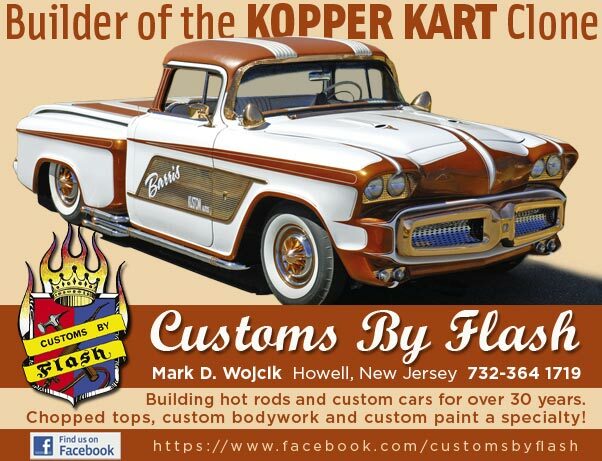 My 56 Merc hardtop had Cob webbing on the panel that is at the tops of the doors. As I recall we just shot almost straight enamel with the gun nozzle cranked down to almost a stream. Yes! Thick paint, low pressure, and a loose-goosey movement over the surface like a Jackson Pollock poseur. Congratulations, Torchie, on that 30 years of marriage milestone. I am pretty sure I remember the ’63 Grand Prix. I lived on Foster road in Rossmore Ca. I was just a kid, about 14. I used to see this cool looking guy pick up the girl that lived across the street. They would be all dressed up with her blond hair teased up. The car was lowered but looked like it really needed a paint job. One night I came pedaling home on my Stingray and under the street light was that car. I was floored. Like, where did the door handle go? Is this real? Am I dreaming? I had never seen anything in my life that stunning. It has always had a place in my mind.